How much does it cost to travel to Hanoi? How much money will you need in Hanoi? d939,066 ($40) is the average daily price for traveling in Hanoi. The average price of food for one day is d252,148 ($11). The average price of a hotel for a couple is d990,197 ($43). Additional pricing is in the table below. These average travel prices have been collected from other travelers to help you plan your own travel budget. How much money do I need for Hanoi? Hanoi is the chaotic capital of Vietnam, and it serves as a great introduction to the country for many travelers. It's the second largest city in the country after Saigon and is an interesting combination of East meets West. There's traditional Vietnamese culture with subtle influences brought by the French. The city continues to grow and change rapidly and it's easy to get lost amidst the chaos. Definitely allow yourself several days to explore the area, sample the food, and do some day trips to the surrounding areas. You can see the colonial French influence in much of the architecture around the city. The city itself continues to develop and modernize, and it is quickly becoming an influence in Asian culture. Hanoi's climate is tropical and the temperatures stay hot and damp through most months. The winter can be surprisingly chilly though and the wind chill and humidity make it feel even cooler. It's best to avoid the hottest summer months when the city feels almost unbearable and the air is very stagnant. There is no shortage of sights in and around Hanoi. Some of the more interesting museums include the Ho Chi Minh Mausoleum, the Vietnamese Women's Museum, Ho Chi Minh Museum, and Ho Chi Minh's Vestige In The Presidential Palace Area. There are also plenty of temples around the area with some of the most famous being the Temple of Literature, Ngoc Son Temple, and Bach Ma Temple. There are also some educational and memorial sights related to the war. These include the Hoa Lo Prison (The Hanoi Hilton), B-52 Lake, and the Army Museum. Parks in the area include Hoan Kiem Lake, Ho Tay, the Lenin Statue and Park, and Ly Thai To Statue and Lake. Also while you're in Hanoi it's worth checking out the famous Vietnamese puppet theater. You can see this at Thang Long Water Puppet Theatre, which is near Hoan Kiem Lake. Also check out the interesting Phung Hung Street Art, located in various parts of the city. If you're interested in traveling through Vietnam while saving money, check out this great guide to Motorbiking Vietnam on a budget. Hanoi has a variety of neighborhoods that are worth exploring. Hoan Kiem is named for the lake and has green landscape and a social setting. In the morning there are many exercisers and during the day there are local families and tourists wandering about. The Old Quarter has winding, narrow streets with flower carts, spice shops, and restaurants lining them. West Lake is north of the Old Quarter and has many palaces and ancient architecture. There are also high end hotels and restaurants in the area. Ba Dinh is where you'll find the Ho Chi Minh Mausoleum compound as well as botanical gardens, the Temple of Literature, the One Pillar Pagoda and many nice hotels. Tourists rarely visit the Hai Ba Trung area and it has many local markets, merchants, and food stalls. It's where you'll find the best local food and a truly authentic experience. There are a variety of activities that you can enjoy in Hanoi. Cooking classes are quite popular and fun. Eco tours and food tours are common as well. There are a variety of markets that you can visit in Hanoi also. Hang Da is a 6 story building with a variety of kiosks and shops. Other markets around town include Cho Hom, Dong Xuan, and the night market which opens at 7 pm in the old quarter. You can also get a massage in Hanoi as the Omamori Spa. Vietnam has a very diverse and delicious cuisine that makes use of fresh ingredients. Soup, or "pho" is a popular dish around town. It is prepared with a variety of ingredients including "Ga" (chicken) or "Bo" (beef). There are thousands of small restaurants around town that serve up dishes with chicken, beef, fish, vegetables, or seafood. Street stalls are also very common and incredibly cheap. They typically offer plastic tables and chairs that you can eat at and the food is quite good. Many of these eateries are located in the Old Quarter. The atmosphere here is great and there are many places that cater specifically to tourists. One of the best authentic restaurants in Hanoi is Bun Bo Nam Bo, so check it out when you're in town. Western food is also abundant but quality can vary and prices are dramatically higher than local food. Pizza, pasta, burgers, and other types of Asian food are all available around town. Street baguettes are also quite common. A good first stop in the city is the Tourist Information Center, which is just north of Hoan Kiem Lake. It's staffed by English speaking attendants who can offer you some great advice and give you a map of the area. You can also access the Internet from their office. If you're traveling a distance of any real length, your best bet is to hop into a taxi. Taxis have meters, but most have been tinkered with, so you'll likely do better to set a price ahead of time. Like everything else in Vietnam, negotiate hard. Don't be afraid to let one taxi go by if they aren't giving you a fair rate and flag down another. For shorter distances, cyclos or pedicabs are a good option. They tend to be cheaper and are a fun way to travel. There are buses that travel through the city as well. They are a little difficult to navigate but are surprisingly comfortable and convenient. There are over 60 bus lines and the conductors are usually helpful with information. 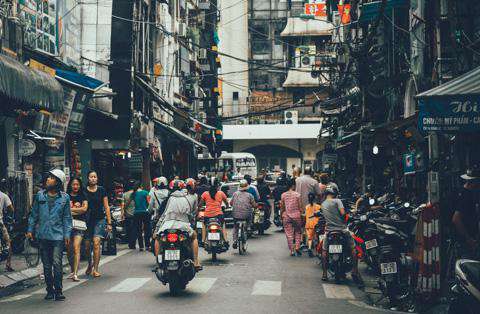 The old quarter of Hanoi is the best place to stay in the city, because you can wander out of your hotel and immediately start exploring the city with its old buildings, small restaurants, and interesting shops. Traffic is crazy, and the narrow roads are full of motorbikes. You don't want to be on one, so just walk around. Don't miss the Thang Long Water Puppet Theatre, it's a unique cultural and artistic show that you won't see anywhere else in the world.